Back of card: Six vertical columns of heiroglyphs. In the center, a scarab set in the center of its own square hieroglyphic design, spanning four of the six columns. At top & bottom, the famous Eye of Horus. Printed in black on light gray. Similar to the front of the cards, the edges of the papyrus are irregular, with a black border overall. Not exactly symmetrical, but you probably won't notice when shuffling the cards. Comments: Another in the series of Egypt-inspired tarot decks. I've been looking at these things too long. I can't find anything on which to remark. 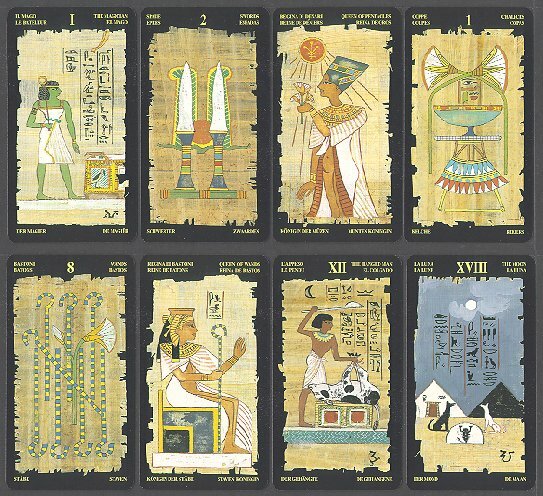 Towards the end of the 18th century an archaeologist called Count de Gebelin made the following historical statement: "The Book of Toth [from ancient Egypt] exists & its pages correspond to the images of the Tarots." They were invented by the God Toth himself & supposedly were used by Egyptian priests for divinatory purposes & initiation rites. Although the statement is based on objectively weak reasoning, it was embraced & accepted all over France at the height of the Egyptian craze thanks to archaeological finds brought back by Napoleon...." - Notes by Ricardo Minetti. So now we have one of the sources for the "Tarots are Egyptian" belief. I agree with Minetti. Gebelin's statement was one of those wonderful flashes of insight that cannot be supported by the available evidence. It appeals to those who want a hoary old source for an authority. For a non-traditional, non-rational deduction of tarot origins, I prefer whatever A.E. Waite had to say about it. Waite was a practicing magician, as were the Egyptian priests. If Waite thought the tarot was Egyptian magic codified, he was well-placed to know. As it happens, I do not know much about Waite, so I can only speculate. A.E. Waite was, without question, the greatest authority on tarot of the last five centuries. The artist, Sylvana Alasia, has created numerous Egyptian tarot decks. Among them, The Cleopatra Tarot Deck and Nefertari's Tarots, as well as the Etruscan Tarot. Her Tarot of the Sphynx is now out of print.